News just in from Martyn Worms at Camberley International as his worldwide central agency, Mondomarine's 40.5m motor yacht Blue Belle has a major price reduction. Built in 2003, apparently her original owner supervised the construction and paid particular attention to every detail during the three-year build period. 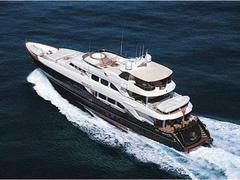 Sleeping ten guests in a master, two VIPs and two twins, her price has come down from €12.45 million to €10 million.